On Dec 15th the 2018/19 edition of the 100 runs in 100 days Challenge, commonly known as 100/100, commences. The thing has evolved somewhat over the past few years, due to and contrary to popular demand. This is the official boast, complain and relate thread, that will remain active until March 24th, the final day of the Challenge. The last few years we have had 500+ athletes from all over the world. Invite your friends. Thanks to Dev Paul for conceiving of and curating this Challenge over the years. This first post is to explain the purpose, and the rules. This goals of this Challenge are to establish a solid run base; to embed a habit of using the run to establish your fitness foundation; and - for some of us - to break out of the my-legs-are-shot paradigm, by which we've convinced ourselves that we can only run once per week. This Challenge honors frequency. Not distance. Not speed. Not effort. It honors regularity. Routine. To prevail in this Challenge you don't see how much you can do; rather how little. Not how hard you can run, but how easy. You might think running that easy detrains you. Try this Challenge. Let's revisit this once you're 60 days into it. 1. Any run that's at least 30 minutes long (see below for exceptions). 2. The runs can be outdoors or on a treadmill. 3. Walking does not count. 4. Aquajogging and elliptical training do not count. 5. You can (and probably should) take days off. 6. You can do days with more than 1 run session; each sessions counts. 7. You get no credit for going longer than 30min; a 30min run is identical to a 60min run for this Challenge. 8. Extra effort gains you nothing. 9. You can go as slow as you want provided both feet leave the ground on every stride. 10. Runs must separated by at least 1 hour to count as multiple sessions. 11. If you do 2 runs shorter than 30 minutes in one day you can count the total as 1 run. 12. Twice per week you can run a session that is shorter than 30min if on the very next day you run a session that makes up the difference, i.e., a 23min run doesn't count, but, if you run a 37min run the following day, then you've officially run 2 sessions. 13. That same paradigm does NOT count for a double run on a given day. 14. These "make up" runs can't be the rule; they're the exceptions; you get to do this twice in a week, and not more. 15. Go to training.slowtwitch.com. You can always navigate there via the blue navbar above (below the ad banner at the top), hover over "Training" (third heading from right) and click on Training Log. 16. Sign up for a Training Log account if you don't already have one (your Reader Forum account is also your Training Log account, i.e., there's one unified login for both). 17. Then look for 100/100 for 2018/19. It's hard to miss. 19. Now start entering your runs in the log. Make sure you only enter runs that combine as 30 minutes as one session. If you have a 20min + 15min day, enter it as one workout of 35 minute or it will not get rolled into the results sheet. 20. Please ensure that you log a distance along with the time. If you don't know the distance, please try to estimate. 21. Your runs will automatically get entered into the Challenge results sheet. 22. You'll see a button on our Training Log allowing you to sync with Strava (in fact, you can see it in the screenshot above). Click that button if you enter your results some other way, in another training log or program. The only requirement for this to work is that your other training log must also sync with Strava. Basically, if your session is on Strava, our log will find it, download it, and your sessions will automatically append to the Challenge. "EricTheBiking" (on the Forum) is our Training Logmeister. He'll answer questions you have about this on this thread. 23. From the Challenges home page, click on the link to go to the 100/100 for 2018/19, you'll see where you and everyone stands. 24. Click on any of the column headers, and it will sort the sheet based on that category (frequency, time, distance, aerobic points). Just, frequency is how we judge this. 25. Please note that you must be logged in to actually enter your data. You can't enter data without logging into your account (seems obvious...). Accumulated Wisdom: This is year-12 of this Challenge. Much has been learned, good and bad. 26. This is an exercise in who can whisper the loudest. 27. Don't try to bank run sessions early. Just trust the process. You'll probably be more successful "banking" runs, as in, performing double runs, later in the Challenge rather than earlier. 28. Take days off when you need to. As your fitness increases, you may find later in the Challenge you can run doubles. Most who hit their 100/100 do take rest days. While some might go for 100 runs, the reality is that unless you are already running 4-6 hours per week, this might be unrealistic. For most a realistic goal is to start at Bronze club pace (or less) and then see how things go. Please put any questions on this thread. Better to put them here than send PMs or emails. Please post stories about your workouts, pictures from running days and chime in to motivate each other on this thread. Don't just log workouts and disappear. The community is what it's all about. And, finally, I'm getting a treadmill (supposedly) today. The plan is to start putting some weekly Zwift run sessions on our Slowtwitch Event Calendar. To those who just got your footpods, or who will get them (working on that! ), if you're a treadmill runner (the 2 things you need for Zwift running is a treadmill and a footpod), you've got the necessary equipment for Zwift Running. I'll be asking you for help on when to hold these sessions (time of day, day of week), and the length, format, and so forth. I'll probably begin a separate thread asking for your feedback. Please also use the social medias and tag your runs either with #ST100in100 or #ST100Runs100Days. Preferably on Instagram, but I'll take what you all can give me. "It ain't easy being green..."
Alright. I'm in, just enrolled. Aiming for Silver, with a stretch for Gold..maybe. i think if it would be illegal in race walking, because they'd deem it running, then it's probably running. that's the best i can give you. Thank you very much for organizing this event Dan, Eric, Dev. Excited to get this thing started! I think I have had my best running years the years I have at least "started" the 100/100. This year will be no exception I hope! Zwift will definitely help on those cold winter mornings too. I'd love to do this to get back into running and train more consistently but I'm only up to run/walking at the moment. I guess that doesn't count? My heart rate would be so high running until I get back in shape. Dude. If you are run/walking, you're running enough for me. Not like the system analyzes your workout and says you went too slow for some parts of it ergo it wasn't a "full run". Log a 30-minute with some kind of running workout type and you're good. What say ye, assembled peers and nutjobs? Hey, team, if you get "Over Rate Limit" messages when you try to Sync to Strava, it's just because y'all are too damn enthusiastic about this thing. Never fear, you can come back and get your data once the buzz goes down a bit. There is a 15-minute limit (which we seem to be bumping into), and a 24-hour limit (which we've never come close to), so just wait 15 minutes and hit 'er again. Works for me. If people can run/walk marathons & ultras, they can run/walk this too. Ok. But, he's only doing this for honor.... No pro contracts. Those are reserved for the runners. The 2xRun in 1 day to get your 30 minutes being entered as one run is pretty straightforward. If we run 20 minutes one day and 41 minutes the next, should those be entered as 30 minutes and 31 minutes, or 20 minutes and 41 minutes? eric may want to answer that. i don't know if he's programmed it to count minutes, or if he'll want you to reapportion the minutes. Right now it doesn't count minutes that way, so you gotta reapportion. Easiest thing is running for 30 minutes, though. But I like to keep the log in lock step with Strava. Yes the definition of running in this challenge is that it would be illegal in an IAAF race walking event. If you're legal for IAAF race walking then it does not count for this challenge. There also has to be forward motion so skipping rope in place would not count. Now I'm not sure what skipping rope around the block would count as!!! OK I'm signed up and ready to go. Slowman thanks for taking care of things. I have allowed myself to get lazy, fat, and unmotivated since I finished Ironman Wisconsin in September (for which I was not adequately trained). Too much food, beer, and half assed workouts. This challenge is just what I need. I've entered every year and I think the best that I have done is right around 70 runs. I am hoping for at least bronze with this addition. Happy running all! I’m entered for the first year ever- hoping to have a six pack before my wedding in March so in addition to runs I’ll be logging and workouts and beers consumed as well for fun. I’ve taken the last 3 days off and I’m ready to hit the ground running tomorrow. 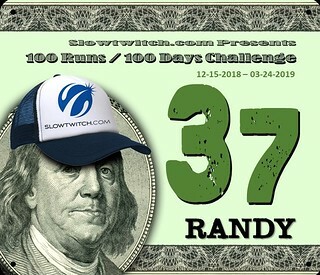 Will Slowtwitch 100/100 participants using the hash tags -- #ST100in100 or #ST100Runs100Days -- be posted to the Slowtwitch instagram page ( https://www.instagram.com/slowtwitch/?hl=en ) ? We'll be regramming some of them, yes. Probably the occasional IG story while I'm at it. So, this is basically about adding a run brick on your bike or swim day and staying on top of laundry. Looks like I'll need to get 2 more pairs of running shorts so I won't run out. Been feeling like a burrito lately ... I'm giving this a shot! "The first virtue in a soldier is endurance of fatigue; courage is only the second virtue." I agree; this time last year I was on run-walk so was logging 30+ minutes but not all of it was at running pace. Hell, even my running pace probably wouldn't satisfy some people on here. I'm running tomorrow anyway so let's give this a try!